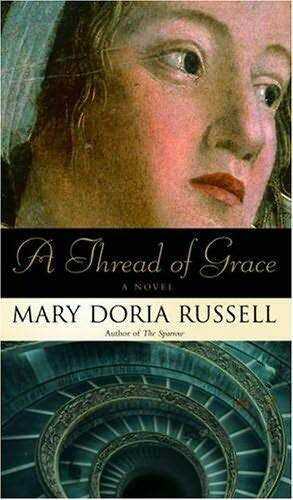 A Thread of Grace is Mary Doria Russell 's third novel and first historical fiction piece set against the backdrop of 1943 Europe. Claudette Blum is a young, teenage Jewish girl escaping with her father and other refugees to Italy with no foresight or knowledge that thair lives are about to become much more endangered. Through a handful of diverse characters and personalities, Russell tells of how numerous Italians played a hand in saving thousands of Jews near World War II's end. The BEST and most AMAZING part of A Thread of Grace is the prelude, hands down! This prelude may be the best I've ever read in any book because it will grip, shock, and pull you in as a reader. Even if A Thread of Grace is not going on your to-be-read bookshelf or wish list, you must stop at a bookstore or pick it up just to read the prelude, at least. All I can say without providing spoilers is "Wow"! A Thread of Grace in its entirety though, I regret to say, is dry and just not as engaging as I'd hoped. I really appreciate Mary Doria Russell 's research invested in this novel, but with the excess of WWII-era novels released in mass numbers these days, it didn't stand out nearly enough for me to really enjoy it from an entertainment or even an educational standpoint. I found myself comparing it to Skeletons at the Feast by Chris Bohjalian ; another WWII novel about refugees on the run seeking safer ground that also brings together a cast of vastly unique and unlikely characters. My review for Skeletons at the Feast can be found here: Dreamworld Book Reviews - Skeletons at the Feast. Mary Doria Russell has won several awards for her first novel entitled The Sparrow (1996), which is followed up with Children of God (1998). I have attempted to read The Sparrow , but was unable to finish. I've come to the conclusion that perhaps Mary Doria Russell and I just aren't compatible!